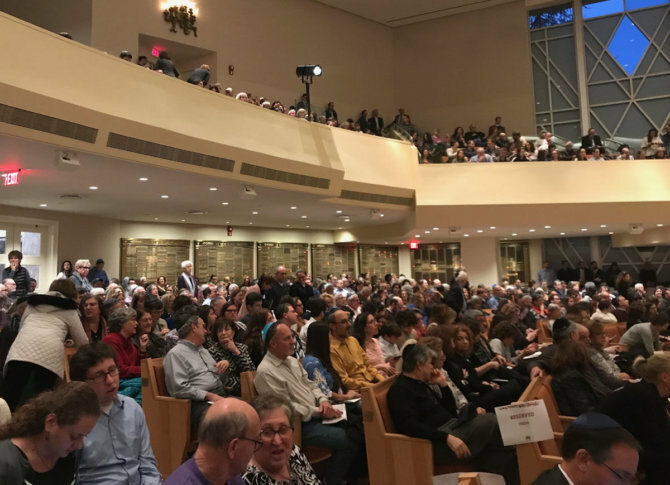 WASHINGTON — The region’s top three elected leaders and religious officials from many denominations gathered for an interfaith prayer service Monday night in Northwest D.C., following the deadly attack Saturday at a Pittsburgh synagogue. Maryland Gov. Larry Hogan, Virginia Gov. Ralph Northam and D.C. Mayor Muriel Bowser offered sympathy and messages of support to the Jewish community at Adas Israel Congregation. Around 1,300 people filled the sanctuary, and an estimated 3,000 people stood outside the D.C. synagogue. Mourners of many faiths joined in reciting Jewish prayers in remembrance of the 11 people killed Saturday, when a gunman burst into the Tree of Life Synagogue in Pittsburgh. The hourlong service culminated with dozens of clergy locked arm in arm in the sanctuary of the synagogue, gently swaying to a song of healing. The main sponsors of the community service are the Jewish Federation of Greater Washington and the Jewish Community Relations Council of Greater Washington. Following Saturday’s deadly shooting, the Jewish Federation of Greater Washington is pledging $100,000 and is asking for public donations that would be used to improve security at area synagogues. “We want to ensure that every synagogue, every communal organization have the resources necessary to provide a safe and secure space for all who choose to enter,” said Zach Briton, the federation’s chief donor experience officer. Funding is expected to be used to provide both long-term security improvements and also be used to boost immediate security needs at some area synagogues. The 20-minute attack Saturday during a baby-naming ceremony at the Tree of Life Synagogue in Squirrel Hill also wounded six others, including four police officers. 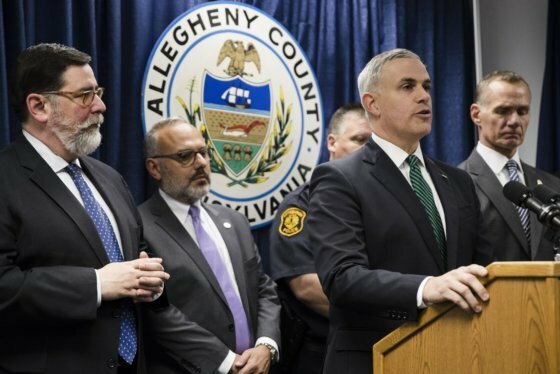 The suspect, Robert Bowers — believed to have spewed anti-Semitic slurs and rhetoric on social media — was charged with 29 federal counts, including hate crimes and weapons offenses. Bowers appeared briefly in federal court Monday in a wheelchair and handcuffs. Prosecutors have said they plan to seek the death penalty against the 46-year-old suspect. WTOP’s Madeleine Simon and The Associated Press contributed to this report.